The new methodology focuses on redundant routes, which is why there seem to be such combinations as 544/554 and 310/747. The other Call and Ride is for St. Charles, where service was previously cut when 802 was restructured and 747 was previously cut. For those on the trivia beat, you might be interested in this Daily Herald article on how suburb to suburb transit isn't so good. Of course, for most of us, the most noticeable thing is bus 2273(? ), except that with the sign saying "DuPage Cty Center" and the run box indicating Route 712, apparently it is a fairly old file photograph; not of the current odyssey. I guess this article is only for Daily Herald subscribers so the pic is the furthest I got before it kicks me out. I don't subscribe, but got the article. Feder said that the Daily Herald was going to a pay model, but I don't know if this problem is related to it. The ride at issue, from Downers Grove to Arlington Heights (and the guy used goroo, which might have been a mistake or not) involved 834 to 313, to 332, to presumably something else that ran from Rosemont though Des Plaines to Arlington Heights (606?). Then there is the usual plug for some transit advocates' group, and Pace saying that it didn't have adequate funds for suburb to suburb transit and that routes like Ill. 83 are not pedestrian (and thus not transit) friendly. Looking at the Public Hearing Notices, there is one to cut back 801 and 802, but at least that one makes clear that the substitute is the St. Charles Call and Ride. Apparently, they are also taking 801 off Ill. 25, which has absolutely no potential ridership and putting it on Randall Road. Update: I was able to Google the map, even though the Pace Access server was down. Starting next month, 301 will extend its Sunday service to Oakbrook Shopping Center. Currently the service terminates at Harrison/Wolf. Also, the last Saturday evening westbound trip will end at Oakbrook Shopping Center and a new eastbound trip from the mall will be added. Also on the holiday service, about half of the West Division routes that operate on Sundays do not operate on Thanksgiving Day or on Christmas Day. That currently includes Route 301. However, with the expanded Sunday service to Oak Brook, the 301 will operate on Thanksgiving and Christmas in addition to the other major holidays (New Year's Day, Memorial Day, Fourth of July and Labor Day), joining the 303, 307, 308, 311, 317, 318 and 332. That leaves the 305, 309, 313 and 322 as the only remaining Pace West Division routes that operate on Sundays but do not operate on Thanksgiving or Christmas. It is so about time, not just for Oakbrook mall but also for Elmhurst Hospital which would get visitors from the 309 before it moved to its new location along the 301 on York NW of the Roosevelt interchange. Even 309 had occasional use on Sundays by hospital users when the hospital was previously located along its route. Actually, the leg between the Elmhurst Metra station and Oak Brook was (and still is) part of the 332. It was just that when that leg ran on weekends, it was interlined with the 309. Since at least the 1990s, however, there was no weekend service at all on York Road in Elmhurst until the 301 was extended to Oak Brook on Saturdays back in 2011. I have heard some riders' opinions that much of the ridership on that portion of the route is of people going to and from the casino (transferring to the casino shuttle bus at Rosemont). If that's the case, and relatively few people actually get on or off of the 303 for work, then the service on the 303 north of North Avenue should be reduced (like having fewer trips go north to Rosemont and having some weekday trips end at North/9th). After all, the primary purpose of the 303/325 merger is to get people living in Maywood and Melrose Park to jobs in the Northwest suburbs, not to get them to the casino. ...After all, the primary purpose of the 303/325 merger is to get people living in Maywood and Melrose Park to jobs in the Northwest suburbs, not to get them to the casino. It doesn't matter who rides it so long as someone rides it. Also, the main purpose seemed to be to eliminate a perceived overlap between 303 on 19th/Broadway and 325 on 25th, which (based on how the rest of Cook County other than the Maywood portion is numbered) is 3 blocks. In any event, Pace has the gps counters, so they know who boards (and probably alights) on each trip. At least they said so when they cut midday service on 240 and 241. And, finally, both the county and state are taxing the hell out of that casino, so if that's the state's definition of economic development, so be it. It provides jobs in a NW suburb. That's really a silly statement. The purpose of a bus is to get anyone from point a to point b. That statement is like saying the PURPOSE of the 152 is to get people to Lane Tech instead of Wrigley Field. But there is no indication that JARC funds are limited to hauling passengers to any particular employment site. For instance, even though 895 is supported by JARC, there is nothing prohibiting anyone from getting on at 95th, riding to Rosemont, and spending the day gambling (or, for that matter, riding to Woodfield and spending the day shopping). *The Shuttle Bug debate was similar, but, again, there was nothing preventing any one from putting $1.75 in the fare box; the only question was what companies were willing to pay for a pass. Even if that is/was the case, and as an O/T, The Rosemont Circulator signs are up (and that should address that "issue"). 303, as an addition, also gets people to the airport from Forest Park and the West Side, without having to through-route the loop (that's if you don't live close enough to the 330). Not necessarily, as Rosemont didn't get the casino, which is in Des Plaines. 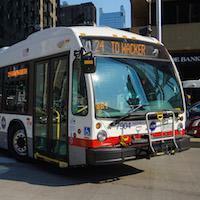 Discussion regarding the Rosemont Circulator has been moved to the dedicated thread. Did anyone go to the meeting about the proposed changes yesterday? From what I gather from the Pace press release, they want to change the high frequency portion from Elmwood Park Village hall to Ogden to the new Summit/Argo to Lake street high frequency section. I think that's a mistake because alot of Green line riders will ride that north and that's going to put a strain on the #90 which runs every 20 minutes itself around 7:00 PM from Lake street NB. Now if they took into account CTA's schedule and ran their service halfway between the #90's frequency than that's a different ballgame and quite smart. I know myself the #318 runs pretty good around 4-5 in the afternoon but alot of those extra trips are in the peak direction only. That service too does get very infrequent around 7PM NB, it's like every hour. Then we have to consider the North Riverside mall riders which may want to pass Lake might now be waiting longer for that service. The #307 also has duplicate service on the south end with the #62H. Maybe they should consider an even smarter frequent routing of Archer/Neva terminal to Harlem/North (#72 turnaround) Now that would probably please the most riders. That's more detailed than what they usually publish before a public hearing, and hence I doubt that the display boards were much different. The increased frequency south indicates that the reduced frequency north won't be as bad compared to current as previously implied. I know the south portion can get as full as most seats taken, but so does the #90 in Oak Park/River Forest in the rush. They probably will have standing loads now on the #90. Maybe that will push CTA into a more frequent service, which wouldn't be bad either. All this could've been avoided if #90 went south to North Riverside (No way in hell it would terminate at 63rd despite transfers to #62, 62H, #63W, and #165. What I don't understand is why #319 couldn't be more frequent and convenient. Who wants to wait 20-30 f'ing minutes for #90??? If #21 can be in Pace's territory (more than 3 miles), why can't #90 do the same??? Given the philosophy of the Crowd Reduction Plan, I don't think CTA either beefing service or extending service in the suburbs is in the cards. It wouldn't be bad to extend #318 to North Riverside. Depends on what its purpose is. Since it is the North Ave. bus, having it run to Forest Park seems to me to be a stretch.